New evidence links solar activity to winter severity. August 26, 2012. The best climatic reconstructions are compiled at the intersection of the sciences and the humanities. Climatic data from scientific "proxy data," like ice cores or tree rings, can be refined using weather descriptions in historical evidence written by contemporary observers. The most useful documents for the reconstruction of past climates are often the most simple and the easiest to quantify. In the straightforward weather observations provided in ship logbooks or financial accounts, for example, relationships between weather, its environmental consequences, and human observers are often the clearest. Describing a simple environmental phenomenon with an easily identifiable meteorological cause, easily quantifiable records of river freezing are especially valuable. Used for decades by Dutch scholars, they have recently been applied to a central European context by an international team of researchers under Frank Sirocko of Johannes Gutenberg University. Writing in the journal Geophysical Research Letters, the authors examine records of Rhine freezing from 1780 to 1963 to conclude that low points in solar radiation, identified by a decline in sunspots, can be linked to frigid central European winters with 99% certainty. The beginning of this period coincided with the last great cold phase of the Little Ice Age, a variable but generally cooler climatic regime that stretched from the early fourteenth to the mid-nineteenth centuries. As chronicled on this site, in recent years scholars have uncovered new evidence connecting everything from increased volcanism to human activity with the origins of the Little Ice Age. While changes in solar radiation have not received as much attention, Sirocko and his fellow authors reveal that fluctuations in the sun's energy must be considered as a significant - if complex - climatic influence. Their study reveals that by altering patterns of atmospheric circulation a decline in solar radiation does not necessarily cool the entire globe. During the coldest winters of the examined period, temperatures declined in central Europe as sunspots were reduced, but changes in the position of the North Atlantic Oscillation simultaneously warmed countries like Iceland. 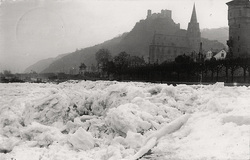 Ultimately, it is possible that the severe European winters of 2010 and 2011 were influenced by reductions in solar activity, although the average temperature of European winters has generally been increasing, and indeed the Rhine has not frozen over since 1963. It is important to remember that although changes in past, present and future climates may be driven primarily by one or two causes, other variables - including changes in solar radiation - continue to have an influence.